Occasionally, the market has significant high or low volume periods, and these fluctuations are so critical in trading that Hawkeye created Volume Radar. With this tool, these unusual changes in volume are highlighted which are often the precursor to a shift in market sentiment and direction. 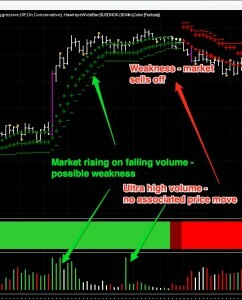 Volume Radar provides an early warning signal to these changes. When Volume Radar calculates any significant extremes, it places one of three dots on the screen. Volume Radar is extremely reliable in the longer timeframes on daily, weekly and monthly charts, and a must-have tool for traders who prefer to trade in those timeframes.